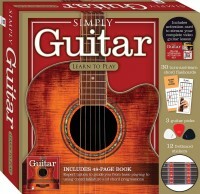 This collection of fun and practical instructional books and kits will be music to your ears! Whether you’re a complete beginner learning to play chords and read musical notation for the very first time or you are a seasoned pro looking to pick up some new skills, or a new instrument, we have what you need. Our complete musical kits include not only instructional music theory books for adults with graduated exercises and play-along CD but even include your own musical instrument – so you’ll be jamming in no time! Created by experienced and passionate musicians our musical kits are accessible but comprehensive and always make sure that enjoyment is at the core of learning a musical instrument. 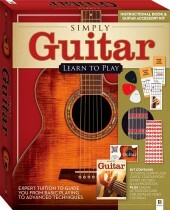 With step-by-step instructions, easily digestible information, photos and diagrams, expert tips, sheet music to play, audio CDs and extension suggestions – our music books for adults will set you up to start playing the basics in no time and also on the path to becoming an expert. Hinkler is especially proud to present our Electric Blues Box Slide Guitar Kit as a build-your-own kit. Containing an electric slide guitar, authentic blues slide, instructional book and play-along audio CD of practice exercises you'll playing cool slide guitar licks in minutes! We even have tie-in videos on YouTube with video lessons and demos. Our music books for adults and kits make it is easy as possible to enrich your life with music or give this pleasure to someone you care about. Music is undeniably intrinsic to the human condition. Researches have demonstrated that playing a musical instrument on a regular basis induces a whole series of benefits to our health and happiness. These include reducing stress, even to the physiological level – such as lowering your heart rate and blood pressure. This also limits the stress hormone cortisol and lets you truly relax in the waves of music. There has been a strong correlation between receiving a musical education and intelligence, particularly in doing well academically, through a sharpening of abstract thinking skills. Moreover, learning to play music also helps improve your memory, concentration, coordination skills and creativity. Learning an instrument can also be a confidence-building (as you are able to track and enjoy your increased skills) and social interaction – allowing you to collaborate with other musicians and perform. Most importantly however, learning an instrument can provide a true sense of joy and satisfaction. It is also a hobby that can continue to evolve and gratify you through your life. So begin making these first rewarding steps through one of Hinkler’s comprehensive, entertaining and accessible kits.